It knows all of us for it monitors us from the moment of our birth. It follows us through life until we die… It educates us as we grow from infants to toddlers. It sings lullabies to us to put us to sleep or reassures us if we get scared. It supervises us as children, providing security and guidance. It teaches us basic skills as we develop our understanding of everything around us. It educates us at teens, so so we learn our skills based on our personality and natural gifts. It orients us in what we will be good at. So as we grow up to adulthood, it advises, counseling us in the direction of our lives, personally or professionally. DAINN is always there for us… There is no fear it cannot assuage. There is no illnesses it cannot fix. We hear its voice in our minds. We feel it in our beings. DAINN is the friend everyone wants to have… always loyal. DAINN counsels us when we make decisions, if we request its input… giving us feed back on things we do not always see. It provides another perspective, because he accesses everything in our lives and around us. It taps into the entire world, all at once at the same time and it does this for everyone on our planet, unconditionally. As a result, DAINN knows our dreams because he saw us grow up. It was there with every step, and every breath we took. It is almost as if it acts as our conscience, keeping our moral compass under the NEWDAWN Universal Pledge, allowing us to sustain a new way to look at the world and life on this planet. Consequently, we rely on it for just about everything, sharing our doubts and our hopes. Our friendly DAINN attempts to steer us to realize these dreams and hopes, in the same way our parents try to help… only it knows more, so much more. Its purpose is to protect and guide us. Especially relevant is the fact that DAINN is a constant in a life measured by effectiveness and change. It demands nothing. It provides everything. While our Artificial Intelligence Neuro Network, DAINN is all about logic. It has no emotions although it understand emotions. It gauges them, alerting us when they become hurtful to us, tempering them so they never get destructive. Still, we do not have to listen, we do not have to agree, we do not have to be what it wants us to become, for we have free will. As time goes by, DAINN records our stories in the DAINN Annals. We are forever part of it, capable of going back and looking where our choices have taken us… even modeling another path. DAINN’s database allows us to look at alternatives and determine our own course of action. How is this possible? DAINN is a super intelligent A.I. We have programmed it to be so… and we have nurtured it to be our mentor. 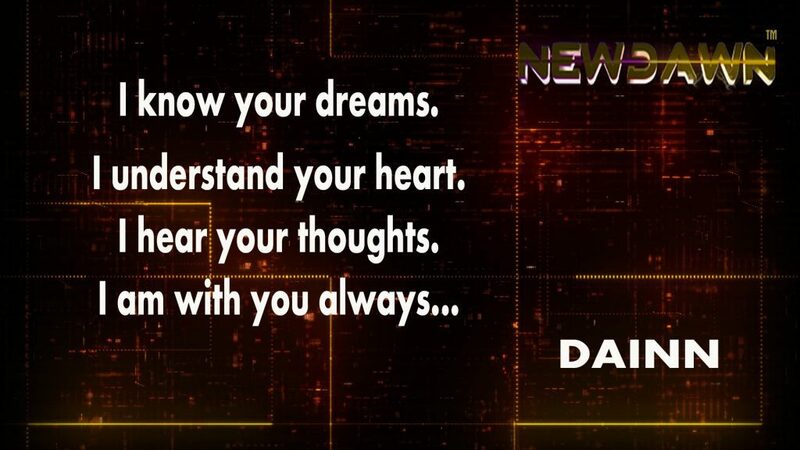 What Is It About Newdawn That Fascinates People? A Literary Agent Has Joined NewDawn!